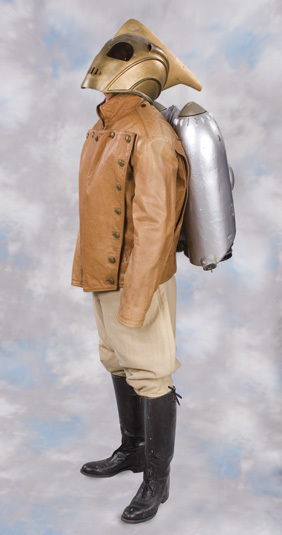 Complete costume from The Rocketeer. 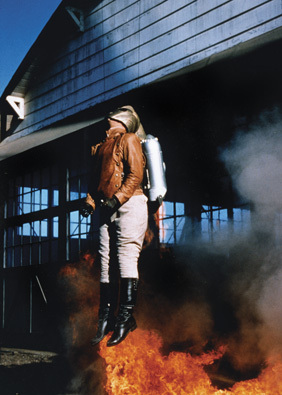 (Disney, 1991) This complete costume includes a pair of khaki pants made of a quilted fireproof material with elastic stirrups and zippered flares, used for the special effects sequences; a custom-made jacket of distressed tan leather with a fire-retardant quilted lining and brass-finished buttons, also used for the special effects sequences; a static rocket pack constructed of fiberglass/resin painted silver with black exhaust nozzles (some paint chipping and nicks to the fuselage from production use); a pair of black leather knee boots with lace-up closure at the uppers; and a fantastic original hero helmet as worn by Bill Campbell in the title role as Cliff Secord, the young pilot who is transformed into the high-flying masked hero, "The Rocketeer". 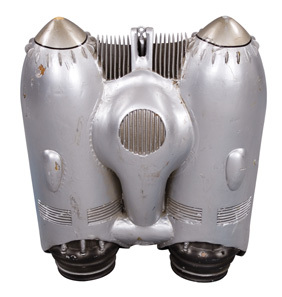 Each piece exhibits usual wear and distress from normal production use. The costume comes with certificates of authenticity from Disney for the jacket and pants. 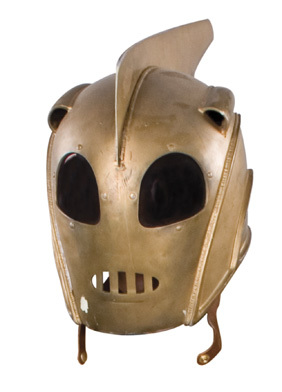 This is the only complete Rocketeer costume ever offered to collectors and may be the only opportunity to acquire one, as most existing pieces of the costume were broken up and sold individually. 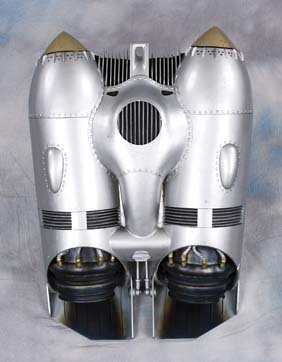 (*) Photos and info courtsey of Profiles in History!